WARNING: Never adjust the sunshade while driving. If your vehicle is equipped with this feature, you can slide or tilt your sunroof with the sunroof control buttons located on the overhead console. 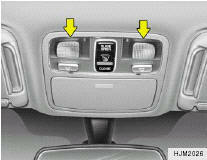 The sunroof can only be opened, closed, or tilted when the ignition switch is in the "ON" position. 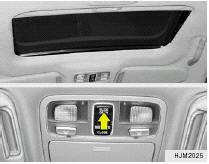 To close the sunroof, press the CLOSE button on the overhead console for more than 1 second. The sunroof will slide all the way close. To stop at the desired point, press any sunroof control button. If an object or part of the body is detected while the sunroof is closing automatically, it will reverse direction, and then stop. 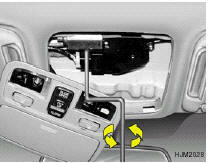 Auto reverse function does not work if a tiny obstacle is blocked between the sliding glass and the sunroof sash. You should always check that all passengers and objects are away from the sunroof before closing it. WARNING: Be careful that someone’s head, hands and body are not trapped by a closing sunroof. WARNING: o Do not close a sunroof if anyone's hands, arms or body are between the sliding glass and the sunroof sash, as this could result in injury. o Do not place your head or arms out of the sunroof opening at any time. o While the vehicle is moving, always keep the head, hands and other parts of the body of all occupants away from the roof opening. Otherwise, you could be seriously injured if the vehicle stops suddenly or if the vehicle is involved in an accident. CAUTION: o Do not open the sunroof in severely cold temperature or when it is covered with ice or snow. o Periodically remove any dirt that may have accumulated on the guide rails. o Do not press any sunroof control button longer than necessary. Damage to the motor or system components could occur. NOTE: After washing the car or after there is rain, be sure to wipe off any water that is on the sunroof before operating it. 3. Insert the hexagonal head wrench provided with the vehicle into the socket. This wrench can be found in the vehicle's glove box. 4. Turn the wrench clockwise to open or counterclockwise to close the sunroof. 1. Turn the ignition key to the ON position. 2. According to the position of the sunroof, do as follows. 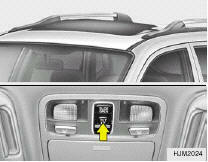 1) In case that the sunroof has closed completely or been tilted : Press the TILT UP button for 1 second. 2) In case that the sunroof has slide-opened: Press and hold the CLOSE button for more than 5 seconds until the sunroof has closed completely. And then press the TILT UP button for 1 second 3. Then, release it. 4. Press and hold the TILT UP button once again until the sunroof has returned to the original position of TILT UP after it is raised a little higher than the maximum TILT UP position. When this is complete, the sunroof system is reset. CAUTION: If the sunroof is not reset, it may not operate properly.